I got one because I had some Amazon credits which made it cheap. Very disappointed. Thinking of sending it back. The games seem like crap and the pads don't work well for some of the games. I wanted Space Invaders! Why don't you add Space Invaders or anything else you want via SD card? No, but to be honest, my interest in the Flashbacks peaked back at the FB2. I don't find that atari games translate well into portable realm. But I didn't mind the Activision cart for the GB SP back in the day. I bought one. I think it's really neat, although the screen is slightly smaller than the portable Genesis, and it has the same sound issues (pitch is off by about a half step). Other than that, though, I have no real complaints. I think some people have expectations that are too high for these price points. What can you really expect for $30? It plays most VCS games almost perfectly except for that sound issue that most people don't even notice. Has a rechargeable battery. Backlit screen. I mean, when Ben Heck first made his VCS portable, people were willing to pay almost any amount for it and that thing weighed like 10 pounds! I think the FBP is pretty great all things considered. I think it's ok to wish for more and then say you're willing to pay for it, but that can be said about almost anything. The trick with any product is to figure out the price point that's going to be the most profitable; not everyone would be willing to pay $80 or $100 for a device like this with more features or better build quality. I'd probably just stick with emulation on a PSP or something if the price was much higher than the $30 I paid. Atari, "crushing it" since 1972. I have too many of those Flashback things. I think some people have expectations that are too high for these price points. What can you really expect for $30? Many people have become used to cheap imports from China and have unreal expectations. People sometimes forget that it's not just scale of production, labor rates and currency manipulation are major factors that come into play. Many of us older folks here remember how much things used to cost, and what WAS considered value for the dollar. When adjusted for inflation the younger generation might spontaneously combust at the thought of paying those prices. +1 on the GB SP Activision cart. Tech is cheaper, too. A single Atari game used to cost $20 or $30 ... (which was like $60 back in 1980 or so), and there are 60 of them on the Flashback (which would be no less than $1200) ... add the other 700 games via SD Card, and even at $5 crash prices, that would be another $3500 back in the day. The stuff inside the modest little Atari Flashback Portable would have been worth the price of a new small car back then. Of course, one of those cars wouldn't be worth more than the $50 asking price for the AFBP today. I have bought one and enjoy it. Especially now that Carrot Kingdom runs on it quite well. If it had a couple controller ports added, so you could play with stick or paddles on tv, I would definitely get the new 2017 one. May get it on sale to have a portable, but not keen on the small screen or lack of convertibility. It would be nice to be to take it on the road and then, at home, hook up controllers and play on TV, including paddle games and games that play better with a stick. I didn't buy one, but only because I thought the design of the system was rubbish. 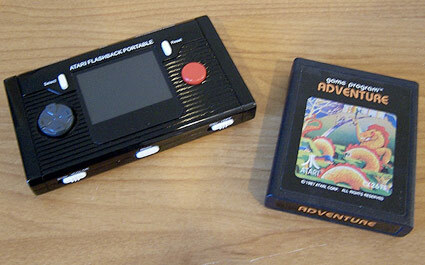 Repurposing the Genesis portable shell for the Atari Flashback Portable was just cheap looking and not to my liking. If they had gone with the original Flashback Portable prototype design concept I would have totally bought one. Edited by Jin, Tue Jun 27, 2017 2:49 AM. Nice design. Still not a fan of the d-pad, but I love the ridges. That rough prototype obviously has nothing to do with AtGames, so there should have hardly been an expectation of them to use it. There's actually a new shell design for the 2017 models, although I suspect you'll not like that as well. Nope, it's just a charmingly strange coincidence that we both have "Jin" in our names and have art of ponies for our avatars. Is this the new shell? Cause if so it looks exactly like the old one. I didn't buy one for one simple reason. I have a hacked PSP. I can run emulators and games from almost every system on it. I rarely play it though. I tend to grab my Gameboy Advance Micro for on the go gaming. I have an EZ Flash 4 cart, so I have some emulators and the entire GBA library with me. Of course there isn't a 2600 emulator for the GBA (That I know of). Still, I would rather play my 2600 games on real hardware anyway. I did break down and buy a Flashback 3 and 4, but it was before I had my Vader, Junior, and 7800. I have nothing against the Flashback portable, I just don't need it and the price seems too high for me to justify getting one anyway. I bought one early this year on special locally, turned it on to make sure it worked and back into the box still with all the wrap on it. I got side tracked, kept staring at the box, and I in the end realized I didn't have an interest or time for it, so it remains as it is now trying to be sold yet oddly no one on ebay has wanted it. Go figure. Yup. Got me one for Christmas, mainly because of the ability to play games off an SD card as I don't have a flash cart for my 2600. I didn't pick one up because I have several ways to emulate already. Nintendo DS, Sony PSP, Android phone, Android tablet. Those are just the portable ones. I can't justify the price for something that doesn't add any features or games I don't already have. No. Am interested though. But at the moment other things come first. If someone would just bite the damn bullet and make a flashback with a cart port I'd be all over that though. Something like the RetroN 77?